Seven days of the week, morning, afternoon or evening, we organize private treasure-hunts,on the occasion of a birthday, or that of a loved one, or maybe even on the eve of your wedding,so you can have fun while saying goodbye to your last day of being single ! 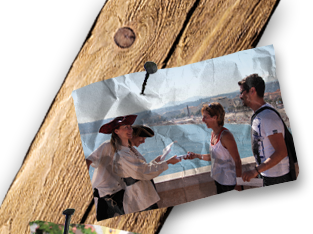 Our treasure hunts have many aims: they are fun, entertaining and rewarding, as well as allowingyou to connect with the history of the city and its unique heritage. If you like, we can even personalize your treasure-hunt on any theme of your choice, so that you will keep some unforgettable memories. During the game, you will meet our costumed characters who will present you with general knowledge quizzes. We can also create quizzes according to your desires. Duration of treasure-hunt: 2 to 3 hours. Recommended: comfortable shoes and hat, or cap.